Unlike the mythological figure from which it takes its name, the French-U.S. Calipso mission dedicated to studying clouds and aerosols hasn’t waited 10 years to release its precious information. Less than 1 year after launch, science data gathered by the satellite are already available to the international scientific community. 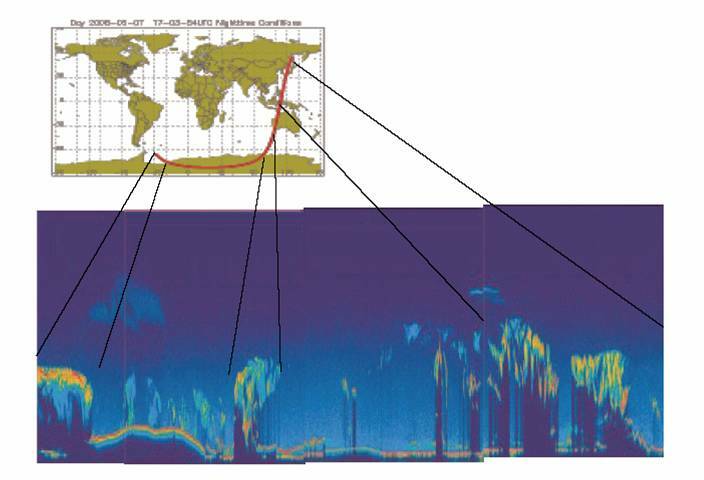 Since its launch 28 April 2006, Calipso has collected a whole series of measurements of the structure of Earth’s atmosphere never acquired before. Equipped with its CALIOP lidar—a sort of optical radar capable of analysing the vertical structure of clouds and aerosols in fine detail—Infrared Imager Radiometer (IIR) and Wide-Field Camera (WFC), Calipso is designed to identify the impact of clouds and aerosols on climate change. Calipso data were made available to scientists worldwide on 8 December 2006, less than 6 months after the satellite gathered its 1st measurements. Less than 1 year after launch, the joint CNES/NASA mission is already proving most prolific. Calipso data are available via NASA’s Langley Research Center or via the French ICARE data centre dedicated to the study of interactions between clouds, aerosols, radiation and the water cycle.